The survey was created as a part of the project activities of the Centre for development of the Civil Society “PROTECTA”, as part of the project "Equality - Women's participation in political parties", supported by the Swiss Agency for Development and Cooperation - SDC. 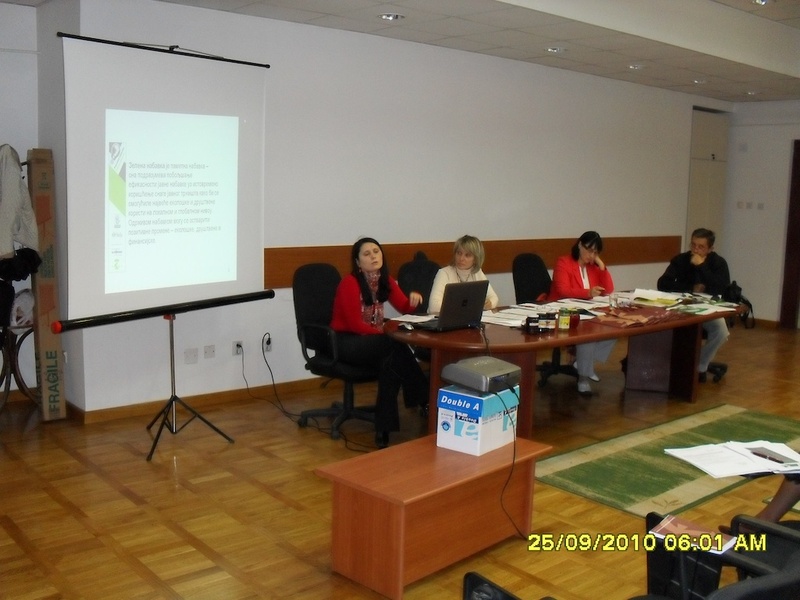 The research on women's participation in political parties was conducted in the municipalities of Bela Palanka, Bujanovac, Dimitrovgrad, Pirot and Presevo in the period from July to August 2012. The survey in Serbian can be downloaded here . The survey in Albanian and Bulgarian will be added on our website soon. As a response to the invitation from the Youth Office in Doljevac, The Center for development of Civil Society PROTECTA executes the training for citizens aged 15-30 years. Training takes place on the 26th and the 27th of September, 2012 on topic "Agro business the best business". The calculation and payment of taxes and contributions. All attendees will receive the literature necessary for training "How to start a business" and the appropriate forms. The training "Agro business the best business" is financed by the Ministry of Youth and Sports of the Republic of Serbia within the project "The Active Youth of Dojevac". 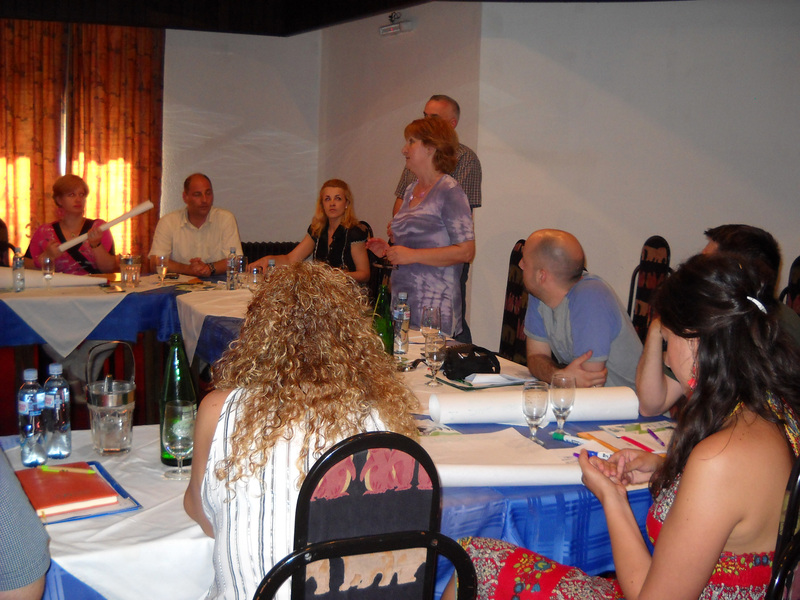 On Saturday 29th September 2012, the association “Serbia in motion” from Belgrade, with the support of PROTECTA organized a training called "Public speaking" for NGO activists within the "How is a doctor like?". The project aims to reduce corruption in the health sector. 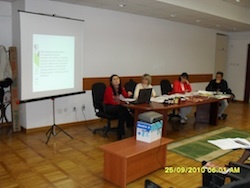 The training was held at the Faculty of Medicine in Nis. 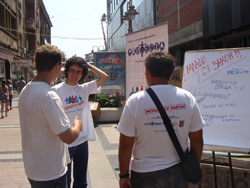 The training was delivered by trained facilitators- the trainers of “Serbia in motion”. The training was conducted according to the model of the organization and leadership developed by Professor Marshall Ganca from Harvard University. The Introduction to the fight against corruption in the health sector and the project " How is a doctor like?" The story about "Now" and connections - connecting story and a call to action. This is a workshop where the students learn about public speaking and how to use their personal motivational stories that move them to action to inspire other people in order to make a change in society. Upon completion of the training the team leaders are selected from the participants (those who show the best results), and then the leaders will pass a detailed three-week training. A FIVE DAY "PROGRAM FOR STRENGTHENING THE CAPACITY OF CIVIL SOCIETY"
As a partner in the project "I know how to act”, PROTECTA, in cooperation with the European Movement in Serbia, Open School in Belgrade and UNECOOP, organizes a program to strengthen up the capacity of civil society organizations in Prolom Banja from the 24th to 28th of September in 2012. The Program of strengthening the capacity of civil society organizations (CSOs) aims to improve the knowledge and skills of CSO representatives for active participation in creating and implementing environmental policy in Serbia. The program is dedicated to informing the CSO representatives with major acts of domestic and EU legislation, as well as with the available legal mechanisms for implementing a responsible environmental policy. The positive experiences and examples of good practice will be transferred by experts from the region of Western Balkan. 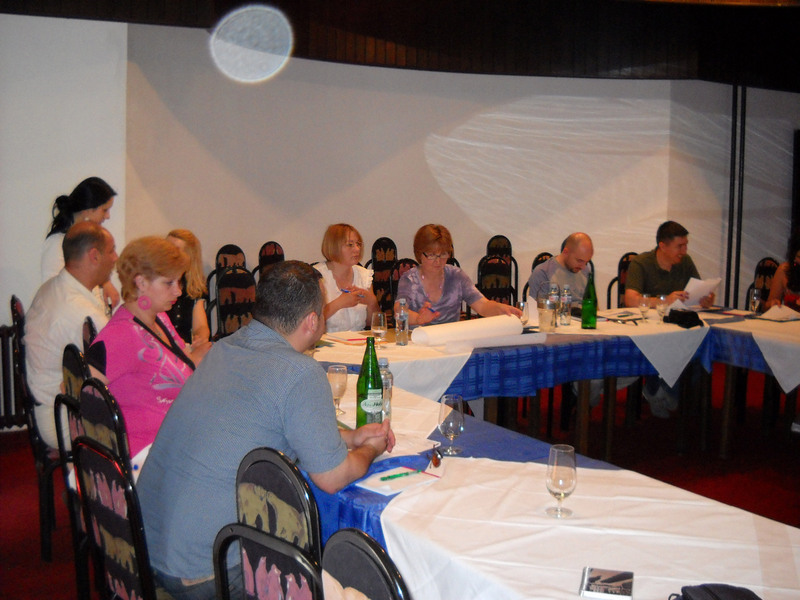 A five day training will be attended by 21 representatives of CSOs from the territory of Nis, Toplica, Pirot, Jablanica and Pcinja municipality and carried out from 24th to 28th September 2012. 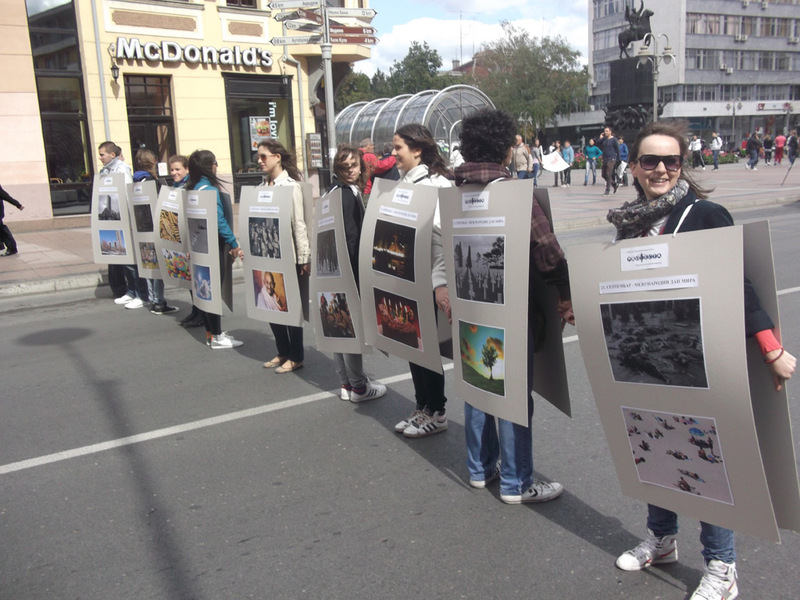 On the occasion of the International Day of Peace, PROTECTA organized a mobile photo exhibition dedicated to peace. 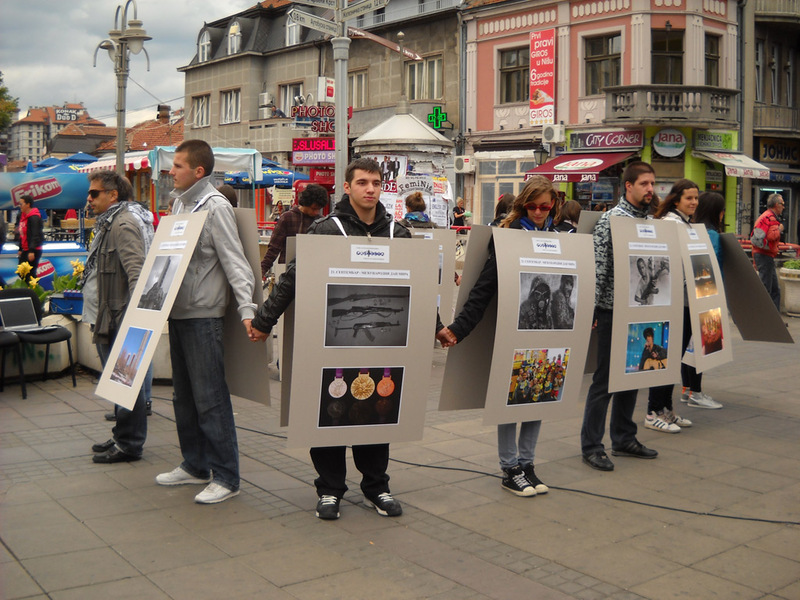 Volunteers of PROTECTA carried boards with pictures, and the exhibition was available to all people walking down the main street from SC Kalca to King Milan Square. 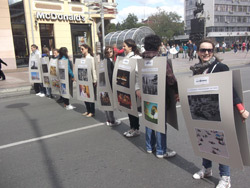 Before the action, exactly at noon, PROTECTA activists held a minute of silence for the victims of all wars so far, according to international action for the World Day of Peace. This morning, the activists of PROTECTA have held peace lecture for the children of the third grade of "Constantine" elementary school, and introduced the importance of peace and peace activism to children. The photo exhibition on the occasion of the International Day of Peace in Power Point can be downloaded here. here . You can also support the idea of peace, do not let wars in which we all lose ever again happen to us. Organized a press conference called "Support the Pride Parade". PROTECTA gives unequivocal support to all social groups in their legal and constitutional right to self-organize and protest legitimately . We appeal to the authorities to provide facilities for each social group in Serbia, including the LGBT population to protest peacefully and to show the problems they are facing to the public. As part of the project “Youth of Serbia for legality”, the first informal youth network for the fight against organized crime and corruption called ACRIMA (Anti CRIMinal Action) was established in Serbia at the summer camp which was held in Sicevo near Nis from August 17-21, 2010. ACRIMA network will be an open network for all NGOs that wish to contribute to the fight against organized crime, fight against corruption and affirmation of the principles of legality. This newly formed network will have the opportunity to become part of the FLARE21, European youth NGO network. Young people will have the chance to gain experience and contacts in the easiest possible way through participation in this network. Center for civil society development PROTECTA organized a summer camp called “Youth of Serbia for legality” which was held from August 17-21, 2010 in Sicevo near Nis. The project is supported by the OSCE mission in Serbia and in cooperation with the FLARE network, the greatest European NGO network for the fight against organized crime. At the camp, workshops were held on the topics of fight against organized crime through the participation of the civil society, affirmation of the principles of legality, good example practices of other NGOs, and fight against corruption. 15 participants from 9 cities (Požarevac, Novi Sad, Sombor, Bečej, Šabac, Pirot, Vranje, Majdanpek i Niš) throughout Serbia were present at the camp. When choosing the organizations, special attention was paid to experience, motivation and geographical coverage. 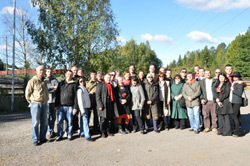 The camp was also an international one, since the lecturers came from Bulgaria, Macedonia and Italy apart from Serbia. Today, on August 12, the International youth Day is being celebrated. In Serbia, this day is being celebrated since 2007 when the Ministry of Youth and Sports has been founded. This holiday has been established 12 years ago by the General Assembly of the United Nations. Every year, on August 12, the richness and diversity of skills are being celebrated, as well as knowledge and willingness of young people to actively support the community in which they live. Center for civil society development PROTECTA begins its activities on the International youth day as the Resource center of the Ministry of Youth and Sports and has organized an action for youth in Obrenoviceva Street in front of the European House from 1pm - 3pm. Apart from the campaign which served to inform the youth which was implemented by the volunteers of PROTECTA, young citizens of Nis had the opportunity to leave a comment on flip charts regarding the needs to which attention should be paid during the design of the Law on youth. 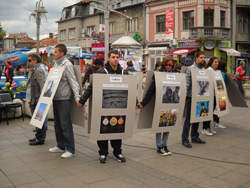 23 youth organizations from Serbia answered the public call announced by PROTECTA for the participation at the summer camp “Youth of Serbia for legality” on July 02, 2010. PROTECTA would like to thank all organizations which have shown interest to participate in this project. Today on July 26, 2010, center for civil society development PROTECTA signed the contract with the Ministry of Youth and Sports and became the Resource center of the Nisava district for participation in the process of building an institutionalized framework for conducting youth policy. All these action will be implemented under the slogan “YOUTH RULE!! !“.More on this in our active projects. All interested youth NGOs from Serbia who wish to socialize, learn a lot about promoting principles of legality and fight against organized crime and corruption can apply for the summer camp which is being organized by PROTECTA. Please carefully read the public call (Serbian version) and in accordance to the instructions fill in the application form (Serbian version). The association of single mothers with the financial help of BCIF organized a seminar on the topic of using funds from the local self-government budget for the work of NGOs, transparency and legitimacy of this process in Sijarinska banja. 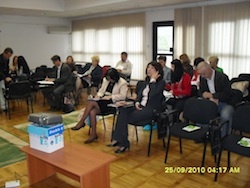 Representatives of around 20 NGOs from Nis and around 10 city institutions attended the seminar. Innovative models of cooperation between these two sectors were discussed together with good practice examples how the city authorities can, besides offering financial aid, support and help the development of NGOs. Milan Stefanovic, executive director of PROTECTA gave an important lecture at the seminar on the topic called “The significance of the Association of citizens’ work in Serbia in the local community”. PROTECTA has been selected as the resource centre by the Ministry of Youth and Sports for the Nisava district to coordinate the process of building an institutional framework for conducting youth policy. After the adoption of the National youth strategy and the Action plan, the next important document concerning youth in Serbia is the Law on Youth. The Ministry expects all youth organizations and institutions dealing with the youth to take active participation in the creation of this Law, and the Ministry plans to conduct activities on this subject with the help of resource centres and their field coordination. More information on specific resource centre activities soon. 22 organizations from around Serbia answered the Public call announced by PROTECTA on May 7, 2010 intended for the civil society organizations in order to participate in the process of forming the national BEWMAN network which will advocate proper electronic waste management in the Republic of Serbia. This network will be created as part of the Balkan E-Waste Management Advocacy Network (BEWMAN) project. It will include 10 organizations from Serbia dealing with the issues of environment protection or fields which are similar to the goals and activities of this project. We are glad that the ecological organizations have shown great interest for forming such a network. Following the given criteria, 10 organizations were chosen among 22 that applied. The choice of organizations was made strictly based on the criteria announced in the public call and are related to projects realized up to now and experience in this area, level of motivation as well as geographical coverage. 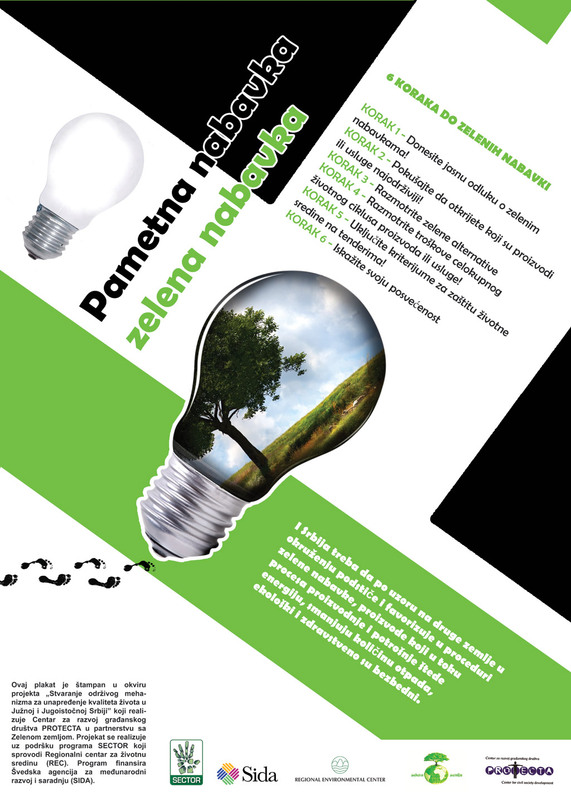 From June 17-19, 2010 a seminar was held in Niska Banja called “Green procurements”. 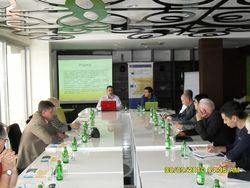 Representatives of the municipalities of Dimitrovgrad, Babušnica, Palilula and Medijana were present at the seminar. Bearing in mind that the public sector controls and manages the resources that are dedicated to procuring products and services, we wanted to define the meaning of the term sustainable/green procurement to the representatives of local self-governments. Sustainable/green procurements are procurements that have the least effect upon the environment and the greatest socially positive effect at the same time, regardless of whether it is about procuring goods, services or works and, of course, what are the financial saves that can be achieved by those procurements. This seminar is part of the project “Creating a sustainable mechanism for enhancing the quality of life in South and Southeast Serbia” (Pantelej, Bela Palanka, Pirot, Babušnica and Dimitrovgrad). A seminar for the representatives of the municipalities of Pirot and Bela Palanka will be held in the period to come. PROTECTA is realizing this project in cooperation with the Citizen association “Green land” from Babušnica. The project is supported by the SECTOR programme which is being conducted by the Regional Environmental Center for Central and Eastern Europe (REC). The programme is financed by the Swedish International Development Cooperation Agency (SIDA). This training is being realised as part of the project “Local self-governments in South and Southeast Serbia, active, empowered for participating in the process of EU integrations - Activate the south” which is supported by the Institute for sustainable Communities (ISC). Representatives of local self-governments from Bosilegrad, Vranje, Crveni Krst (Niš), Preševo and Bujanovac will undergo an education as part of this project on the topic of European funds available to Serbia (IPA funds) through a training for writing projects in the EU format. This education will help the representatives of local self-governments to design suitable projects and apply to some of European funds with the help of PROTECTA. A round-table conference called “The media and non-governmental organisations – challenges and opportunities” was held in Niš on June 9, 2010 in the hotel “Aleksandar” which was organised by PROTECTA, TASCO programme, and the Civil initiatives. The round-table conference gathered representatives of eminent non-governmental organisations from Niš and representatives of the media from Niš who tried to analyse the situation regarding the cooperation between the media and the NGOs in Niš and in Serbia during a two-hour discussion, and tried to offer mutual recommendations for enhancing future cooperation. The introduction to this round-table conference on behalf of NGOs from Niš was held by Milan Stefanović, executive director of PROTECTA, active in non-governmental organisations for more than 15 years, and the representative on behalf of the media was Dragan Videnović, former editor of TV5 and the director of the Media centre, currently working as a PR in one of the city offices. Conclusions from this round-table conference will serve to design recommendations for the development of the cooperation programme between the NGOs and the media in Niš. An action of cleaning and tidying the school and the school yard was conducted on June 5, 2010 regarding the World Environment Protection Day. Over 900 pupils of the “Miroslav Antić” primary school cleaned the school with the help of parents and teachers from 10am – 12pm. 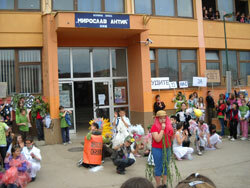 At 12pm they did a school show in front of the school after which the ECO corner was opened. The action was visited by the mayor of Niš, Miloš Simonović MSc, president of the City Municipality of Pantelej, Slaviša Dinić and the president of the City Miunicipality of Medijana Dragoslav Ćirković. This action was part of the action of the Big cleaning of Serbia which was organised by the Ministry of Environment and Spatial Planning on the territory of entire Serbia. 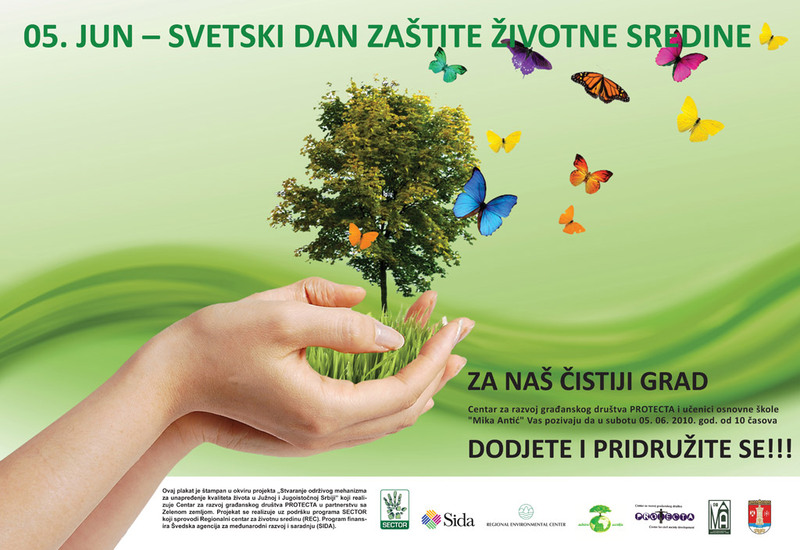 This action was conducted as part of the project “Creating a sustainable mechanism for enhancing the quality of life in the South and Southeast Serbia” which is realised by the Center for civil society development PROTECTA in partnership with Green land. The project is being realised with the support of the SECTOR programme which is being conducted by the Regional Environment Centre (REC). The programme is financed by the Swedish International Development Cooperation Agency (SIDA). The action was also supported by the Municipality of Pantelej, Private company, Deni Komerc and the Public Communal Company Gorica. PROTECTA will realise a project called Youth of Serbia for Legality with the help of OSCE mission in Serbia and in cooperation with the FLARE Regional Balkan Office from July until September. The first summer camp will be organised for the youth NGOs on the topic of the fight against organised crime and the first informal NGO network in Serbia will be formed on the topic of the fight against organised crime. We will also organise 7 mini campaigns in 7 cities of Serbia on the topic of the fight against organised crime and on the topic of a more active participation of the youth at the end of the project. More about the project form July 1st. The 1st international ecology, energetic efficiency and renewable energy sources Fair was opened today in Nis in Cair hall. 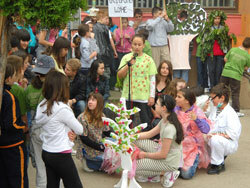 The fair was opened by the mayor of the city of Nis and the Minister for the environment Oliver Dulić. The fair will be held from May 31 – June 02, 2010. The Fair is dedicated to newest achievements in the area of ecology, energetic efficiency and renewable energy sources, with distinguished companies from Serbia and abroad displaying great interest, as well as local self-governments from whole Serbia. Among the representatives of the institutions and companies at the stands, there are also 12 NGOs among which is the Center for civil society development PROTECTA who also have the opportunity to present their projects and results in the areas of the environment. You can read more about the Fair here (Serbian version). Center for civil society development – PROTECTA organised a press conference on May 21, 2010 together with the last training within the “Young leaders together – networking and strengthening Youth offices, youth organisations and informal groups” project. Representatives of PROTECTA were present at the training along with representatives of youth offices and youth organisations from Nis, Aleksinac, Bela Palanka, Svrljig, Blace and Dimitrovgrad. Presentations of local actions were held which the youth offices conducted in their communities within this project and the evaluation of them. You can read more about the project itself here (Serbian version). 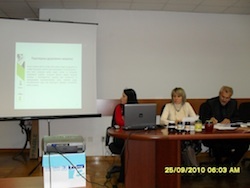 The working team for designing the strategy for the safety of the city of Nis held a presentation for the public on May 12, 2010 in the City Assembly regarding the final version of this document. PROTECTA, through its representative in the working team Milan Stefanović, successfully participated in the design process of the strategy for safety which lasted for several months and which was successfully guided by the team of experts from the Job Safety Faculty. You can look at the strategy for safety proposal here (Serbian version). Today, a press conference was held in the Media Center Nis regarding the realisation of the new PROTECTA project. The project is supported by the Institute for Sustainable Communities (ISC) and bears the title “Local self-governments in South and Southeast Serbia, active and empowered for the participation in the EU integration process – Activate the south”. You can download the press release here (Serbian version). Center for civil society development PROTECTA from Nis announces a Public call for the organisations which want to become involved in the process of forming a national network which will advocate proper management of the electronic waste (E-waste) in the Republic of Serbia. This network will be formed within the Balkan E-Waste Management Advocacy Network (BEWMAN) project and will include a minimum of 10 organisations from Serbia which are dealing with the environment or areas whose goals and activities are similar to those of the project. The common goal of the project is to improve the legal and institutional framework which will enhance the management of E-waste in four Balkan countries (Serbia, Macedonia, Croatia and Bulgaria). PROTECTA is the national partner for Serbia on this project. The project will last for 24 months. More about the public call here (Serbian version). The Regional FLARE Balkan office was opened today for the public and the media. FLARE network is the biggest European non-governmental organisation network with over 40 members in 24 countries of Europe and the Middle East. The press conference was held in the Media Center Nis by Milan Stefanović, executive director of PROTECTA and the Regional coordinator of the FLARE Balkan network, and Milan Petrović, PROTECTA coordinator for the youth programme and the FLARE project coordinator. The Regional FLARE Balkan office will geographically cover: Albania, Bulgaria, Bosnia and Herzegovina, Croatia, Cyprus, Greece, Kosovo (resolution 1244), Macedonia, Montenegro, Serbia and Turkey. The priorities of the office will be the fight against organised crime and the social re-use of assets confiscated from the organised crime. The Regional FLARE Balkan office was opened with the great technical and organisational help and the support of PROTECTA. You can read more about this topic, the Regional Balkan office and the FLARE network itself here (Serbian version). The Ministry of Environment and Spatial Planning signed a memorandum on cooperation on April 29, 2010 with over 120 organisations of civil society, among which is the Center for civil society development PROTECTA. This was done with respect to the role of civil societies in building of a civil democracy process as well as their contributions to the protection of the environment and recognizing the interest for establishing closer cooperation for the sake of improving the conditions of the environment and raising civil awareness. 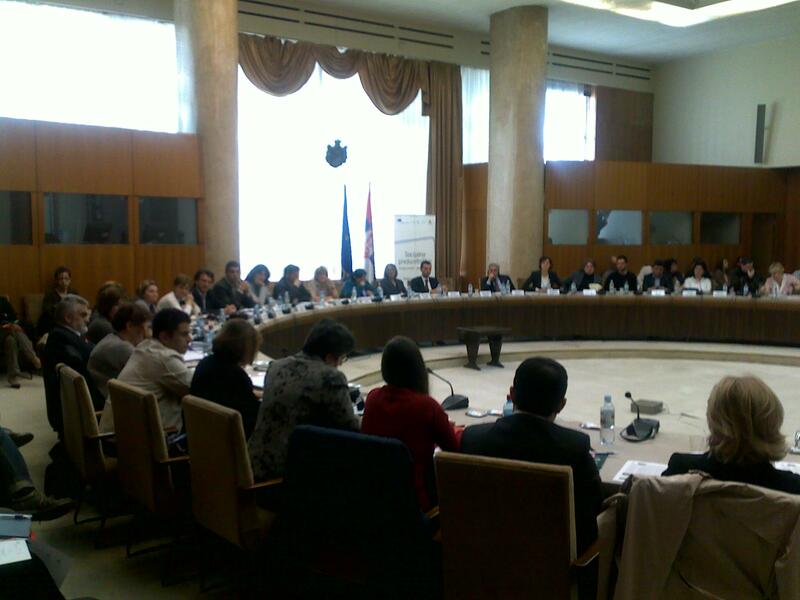 The topics of the conference were the steps to take next in the process of decentralisation of Serbia. The speakers on the conference were local and foreign experts, participants and guests of the Conference. The national conference on decentralisation was opened by Mr. Boris Tadić, president of the Republic of Serbia, and the participants were addressed by high officials, among which were Mr. Vincent Degert, chief of the European Delegation in Serbia, Mr. Thomas Moore, Acting Head of OSCE Mission to Serbia, Mr. Constantin Yerocostopoulos, ambassador and special representative of the Council of Europe secretary general in Serbia, Mr. Nenad Čanak, chairman of the national council for the decentralisation of Republic of Serbia, Mr. Mlađan Dinkić, vice president of the Government and minister of economy and regional development, Mrs. Diana Dragutinović, minister of finance in the Government of the Republic of Serbia, Duško Radaković, state secretary in the Ministry of Public Administration and Local Self Government, as well as other officials, representatives of the civil society and academic community. Having in mind that the Government of the Republic of Serbia has entrusted the job of designing the Strategy of decentralisation of Serbia to the National council for the decentralisation of the Republic of Serbia, the goal of the Conference was to initiate a wide dialogue with the inclusion of all relevant participants for the exchange of information, knowledge and experience in the process of preparing the Strategy of decentralisation. 3. Financial independence: fiscal and asset decentralisation. Each of the theme panels was opened by referent experts from Serbia and abroad. The first meeting of partners on the “Balkan E-Waste Management Advocacy Network” project, (Metamorphosis Foundation (MK), ComputerAid International (UK), ZaMirNet (HR), and BlueLink Foundation (BG), was held on April 7, 2010 in Skoplje. The national partner for Serbia is the Center for civil society development PROTECTA. The project will last for two years. The main goal of the project is improving the legal and institutional framework which will contribute to the proper management of E-waste in Serbia, Macedonia, Croatia and Bulgaria. The specific goals of the project include the development of the network for the regional cooperation and exchange of experience among the Balkan countries based on good practice examples from the EU, increasing capacities of civil society organisations from Macedonia, Serbia, Croatia and Bulgaria in advocacy and representation regarding issues related to E-waste and raising awareness about proper management of E-waste between citizens, local authorities, business sector, non-governmental organisations and the media. More about this here (Serbian version). The project is supported by the Institute of Sustainable Communities (ISC). The goal of the project is to raise capacities of local self-governments through educations on the topic of European funds available to Serbia (IPA funds) through a project writing training in the EU format. It is planned that the first phase of the project will cluster 6 municipalities from the regions of South and Southeast Serbia: Dimitrovgrad, Bosilegrad, Vranje, Crveni Krst (Niš), Preševo and Bujanovac. The aforementioned municipalities represent highly multiethnic communities, for example: Preševo and Bujanovac consist mostly of the Albanian minority; Dimitrovgrad and Bosilegrad of the Bulgarian minority; Vranje and Crveni Krst of the Roma population. This project offers the possibility of inclusion into the information system of the European houses in the South and Southeast Serbia, apart from educating representatives of the local self – governments, where they will have access to our resources and not just information, and have European houses as partners. In partnership with the civil association “Green land” from Babušnica, PROTECTA began the realisation of the project “Creating a sustainable mechanism for enhancing the quality of life in South and Southeast Serbia” within the SECTOR programme. 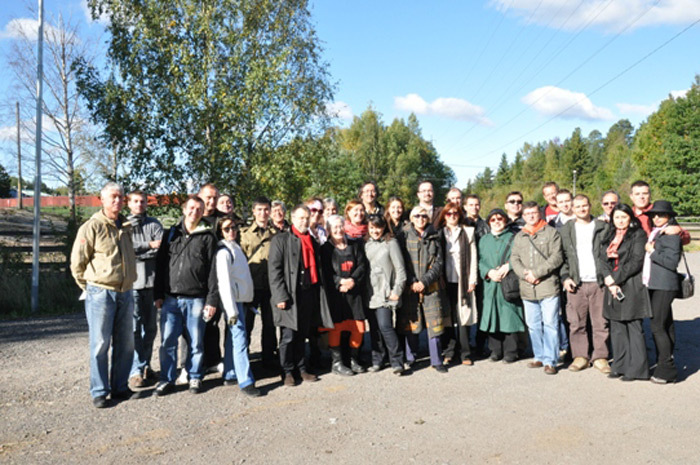 The SECTOR project was launched in 2006 by the Regional Environmental Center for Central and Eastern Europe (REC) and the Swedish International Development Cooperation Agency (SIDA), with the goal of supporting the civil society in the field of environment and promoting the development of a strong and democratic civil society in the field of environment in the Western Balkans. The project “Creating a sustainable mechanism for enhancing the quality of life in South and Southeast Serbia” deals with the promotion of the sustainable development and enhancing the quality of life in the urban areas of the South and Southeast Serbia (Niš - Pantelej, Bela Palanka, Pirot, Babušnica, Dimitrovgrad). The main goal of the project is creating a permanent mechanism for enhancing the quality of life in the South and Southeast Serbia. This mechanism consists of several pre-actions (Education, Campaign, Analysis, Research) as well as of reaching 5 municipality decisions which regulate the process of public procurements, tenders and municipality procedures with the goal of sustainable development and enhancing the quality of life in the urban areas. Expected results: Created mechanism which will contribute to the sustainable economical development, established system of proper collection and selection of waste in the buildings of the local self – governments and local institutions, educated population on the topic of environment protection through direct involvement into the project activities, encouraged decision makers regarding the responsible behaviour towards the local community, increased awareness about the existing problems of the region, established partnership within all three sectors and interested parties.